A watercolor invitation can be just what you need to distinguish your wedding as an original expression of artistic intent. Personalized weddings hold great appeal for both the engaged couple as much as the guests who will attend. Novelty and uniqueness ensure you satisfy the innate desire for uncertainty that we all crave! Watercolor as an art form requires talent. One must know color theory, blending, washes, and a host of other techniques in order to paint a worthy piece of art. That being said, you don’t need to be a professional artist! You can do a DIY watercolor invite for as many as you need. Read on for more about DIY vs professional watercolor artwork. 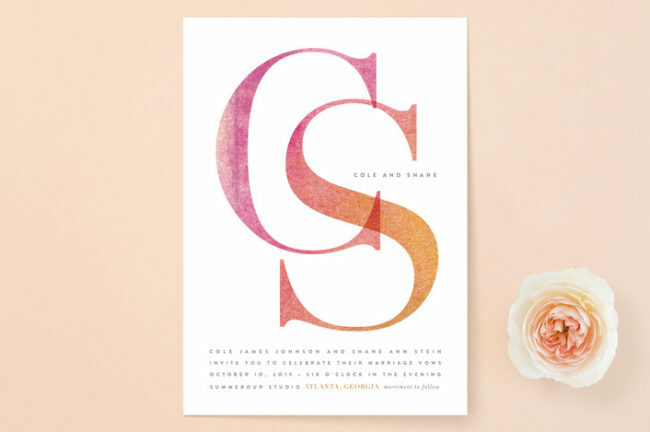 Watercolor inspired invites lend themselves to almost any style of celebration. 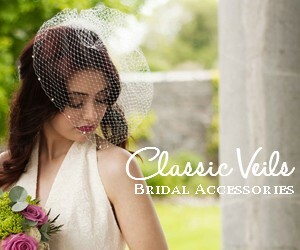 There is a huge number of designs and details available online that you could consider. 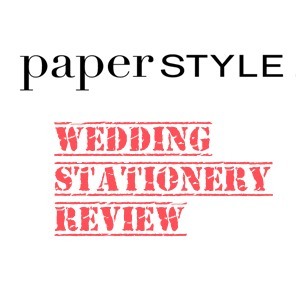 We looked at several different stationers to find our top picks. 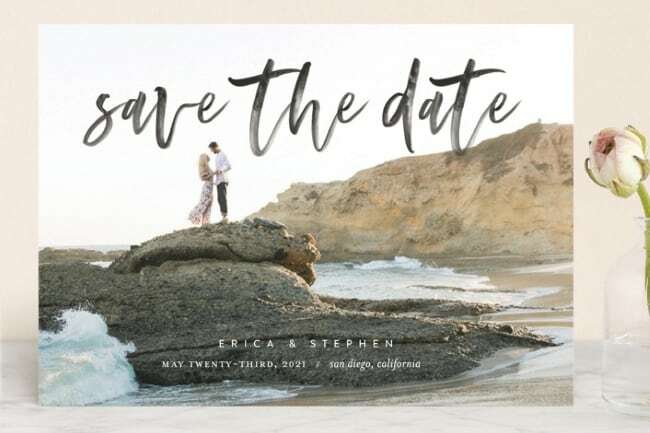 We hope you enjoy our curated selection of the best watercolor wedding invites we’ve come across while browsing popular online stationers. We love the industrial geometric design from Hooray Creative out of Philadelphia. Amethyst inspired hues of light pinkish violet to deep purple blend together to create a wonderfully artistic expression. Coupled with a rose gold real foil shimmer, which adds a luxurious touch as you can see from the photo above. Want more than just a lovely invite? Create an entire suite of paper goods including table numbers, place cards, menus, stamps, and even a matching wedding website. A designer from Arizona delivers a watercolor wash of gray and shimmer speckles called Zen Horizons that really dazzles. Color options include the moody gray above, a seashell pink or turquoise. You can buy online from a trusted stationery like Minted, and have these beauties delivered right to your door. Typography invites have an appeal all their own. Sunsprite feels energetic and uplifting, just the type of invitation you’ll want to send out to set the tone for your grand affair. Up the appeal by choosing a rounded or scalloped edge instead of the normal square edge. The great thing about using watercolor paint as a basis for an invitation is that even beginners or amateurs can achieve a meaningful result. Expensive invitation suites aren’t always needed. If you plan on hosting a DIY wedding with a particular color scheme, choose the budget conscious route by creating your own watercolor invites, RSVP cards, and other paper goods. Creative individuals who may not consider themselves professional artists can still have fun through painting unique invites. Its easy to pickup supplies like watercolor paper, brushes, and paint at your local art supply store or online. Then browse for a simple design you enjoy and could quickly recreate. Got a good photo you’re proud of, which you want to turn into a watercolor invite? Another option we tested is to use a popular online photo effect filter such as the one offered by Fotor. Simply upload your photo to their website, choose the desired filter effect, and download your image. Easy! Here is a quick example of a photo I took while working in Budapest, Hungary earlier this year. I will point out that I am NOT a professional photographer by any means. However, I am able to capture a few photos now and again that I am proud of displaying. 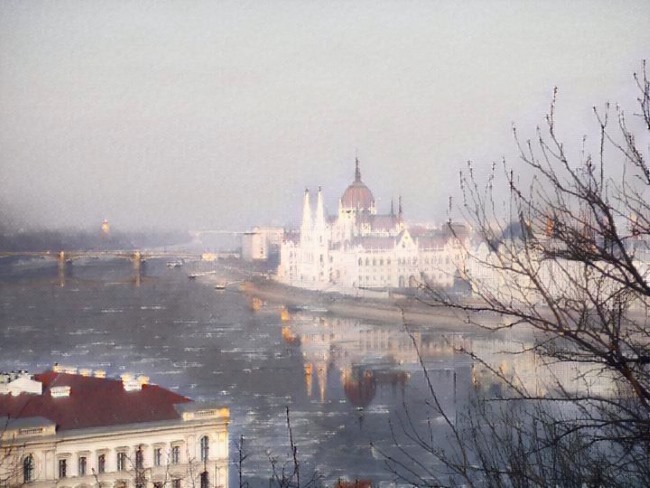 This particular January afternoon was calm and bitterly cold, and I really like the hazzy atmosphere and mood of the Danube River. 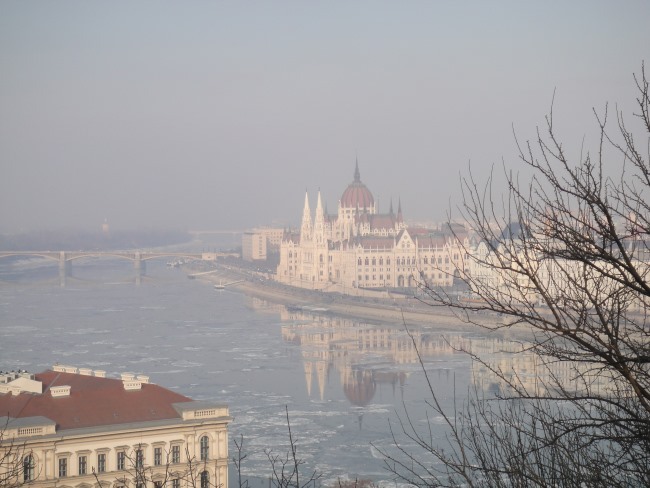 Perhaps it could do as a prelude to a winter destination wedding in the romantic city of Budapest? To transform the image online using Fotor literally took 30 seconds to upload, apply the filter, and then download the new ‘watercolor image’. You can then print out the watercolor enhanced image either at home or at a local print shop. This is a truly cost effective way to DIY and personalize your wedding invites, RSVP, and other stationery needs. Your Turn: Go back through your piles of digital photographs you’ve taken over the years and see if you can’t transform one into the perfect watercolor invite! If you have neither the time nor the creative spark to DIY using watercolor, choose a talented designer instead. 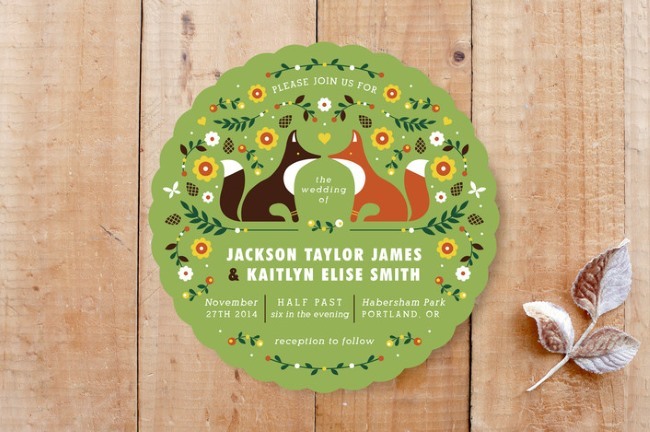 In this article we showcase a few designer’s work as inspiration for your wedding stationery needs. These talented individuals prove that creative artwork using watercolor comes in limitless form. 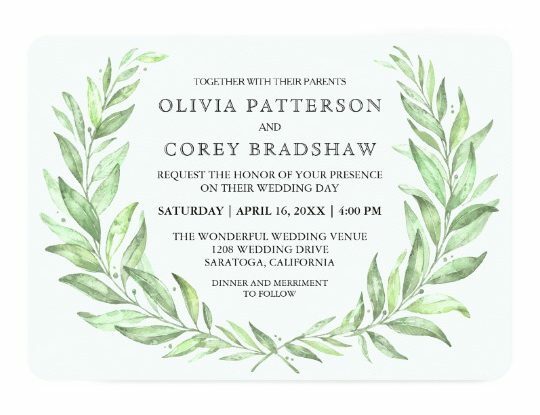 We like the splash of artistic watercolor washes that Shimmer invite has to offer. Together with real gold foil swirls, the framing effect projects an elegant formal welcome to your wedding guests. Customize the color and opt for a peacock blue, emerald green, or dusty pink instead of the mauve purple pictured above. Another wonderful watercolor design we found from a Pro designer on Zazzle. Greenery is a hot wedding trend in 2017, and this laurel wreath invite clearly expresses a rustic boho vibe with greenery as the main theme. Custom options are available for different sizes and shapes. The two styled shoots below are a real treat in terms of showcasing exactly what you can accomplish when you look to integrate a watercolor theme across your wedding day. The first one in dusty blue and copper tones is absolutely brilliant for its use of a distinct blue color theme in many elements. Of course, the venue helps to set the tone in a less-is-more decor atmosphere. 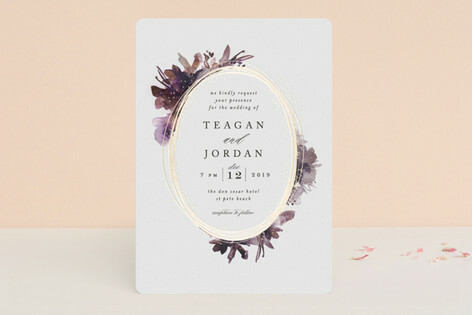 Nonetheless, the watercolor invitation design does its job quite well by highlighting both color tones and stylistic nuances. The second styled shoot proves that you can also have an upscale glitzy affair and use watercolor as your starting point. The watercolor washed invites hint at a glamorous metallic silver themed gala event that one wouldn’t want to miss!